I will say this first. It’s my 9th birthday stage! Every year, lots of people come up with various ideas! This year too, there were lots of happy surprises. And everyone holding the uchiwa! The results were 2nd Place!!!! During the handshake events, many people came and apologized for not getting me first place. Although I have said it on stage during the senbatsu election. I am truly satisfied with the results. I have absolutely no regrets!!! But this year, I felt the election isn’t like that at all. Aiming for No.1 was decided by me. But most importantly, was the kind and strong push on the back from everyone. I realized just how many people are supporting me, I am truly happy. Of course this year’s 2nd place result is great, but it’s the serious support from everyone that has made me really happy. Really, truly thank you very much! Next single is Halloween Night. I want to sing this with feelings of gratitude for this position that I have received. Speaking of, I was truly happy yesterday. I was happy to receive letters from Riechan and Riorin. To be allowed to take part in this group that is starting from scratch along with Riechan, I will do everything I can to bring excitement to this group. I want to continue to hone my performance. and aim to have my own unique performance style. This has become verrrrrrrrry long…. Really and truly thank you so much! That is one long post! Warning was in order. Thanks for the translation. 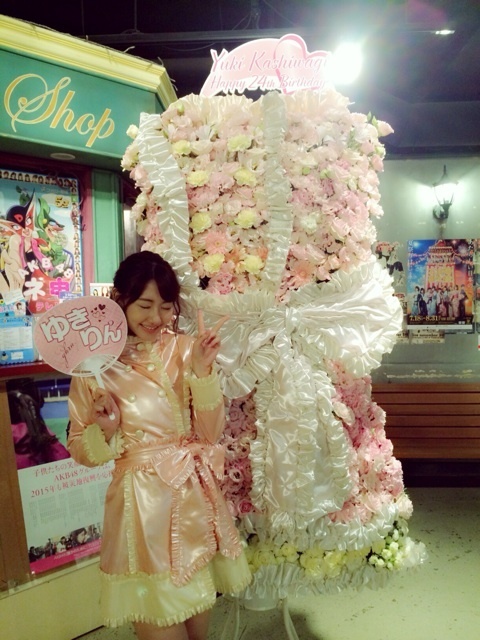 Yukirin is still Yukirin, thank God. I hope that the LIVE does happen still. Great to see that she is on the same page as the fans on that.